Irked by the loathsome "Zambrano mows my lawn" shirt found on one Cardinals fan a couple weeks ago, the Wrigley faithful come back with their own interpretation. Yes, Albert Pujols, one of the MLB's best players and most kind-hearted human beings, is also apparently mowing lawns for some Chicago area residents. This shirt was spotted by members of the Big Dead Sidebar blogging outfit while they strolled Wrigleyville during the Astros series. Granted at least they didn't have the gall to wear it during the Cubs-Cardinals series when a Redbirds fan decked out in his Zambrano lawn-mowin' shirt might take offense or claim copyright infringement. 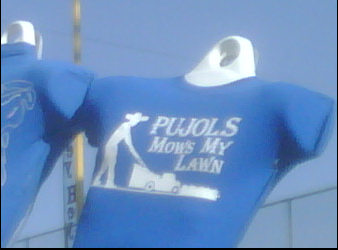 I'm disappointed the Cubs version read something like "Pujols Mows MY Lawn." Show a little distinctiveness. Thank you for your continued support of Deadspin. And thank you to the pending commenter who gifted us with this gem: "Hey, I just saw A.J. on NFLNetwork. He looks like a complete douchebag." Affirmed. Maybe it was because I wearing a Van Halen t-shirt? Too much?